This is a small-capacity rotary rock tumbler for a person who wants to try rock tumbling at a low entry cost. Here are the advantages that it offers over the cheap plastic toy tumblers that we refuse to sell: 1) it is quiet because the barrel is rubber instead of plastic, 2) it tumbles at least twice as much rock, 3) it will last for years with reasonable care. This kit gives you everything needed to start tumbling. Refill kits with all rough rock and grit needed to run the tumbler are available. More Information! This A-R1 rotary tumbler is a slightly larger tumbler than the MP-1 shown above. It quietly tumbles about twice as much rock. It also has a higher quality motor that will provide many years of service. The kit has all of the rough rock, abrasives, polish and instructions to tumble your first batch of rocks. It also contains instructions and a small jewelry craft kit. A great gift for the beginner! Refill kits with all rough rock and grit needed to run the tumbler are available. More Information! The Thumler's A-R2 tumbler has two three-pound barrels. It is very easy to use and the soft rubber barrels will tumble your rock quietly. Having two barrels gives you a lot of advantages - two people can share the machine with each having a barrel, or you can run two different types of rock at the same time. 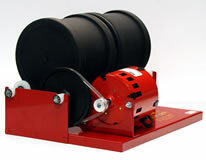 Refill kits with all rough rock and grit needed to run the tumbler are available. More Information! The Thumler's A-R12 is a large-capacity tumbler, processing about eight pounds of rock. Or, you can easily convert it to run two three-pound barrels (sold separately). Some people who reload ammunition use this tumbler to polish brass pistol and rifle casings. This tumbler is recommended for adults. More Information! The Thumler's Model B is a professional-quality rock and brass tumbler. It easily tumbles about 10-pounds of rough rock. This model has a low-speed motor that word best for rocks. We sell them with a faster motor for tumbling brass casings on our brass polishing section of the website. This tumbler is recommended for adults. More Information! Rotary rock tumblers are the most-often used type of tumbler for producing tumbled stones. The tumblers that we sell have soft rubber barrels to allow them to run quietly. We sell over 1000 tumblers each year and have never had one returned because it was "noisy". Rotary tumblers are the best type of tumbler for the beginner because they are easy to operate. If you follow our tumbling instructions and start with high quality rock, you should be able to produce lots of brightly-polished tumbled stones. We sell all of the rough rock, grit and polish that you will need. We even sell refill kits to keep you tumbling. Or, maybe you know where to collect rocks for your tumbler. The other type of tumbler commonly used for rocks is a vibratory tumbler. They are generally faster and more economical to operate. They cost a little more and require some practice and judgement to use successfully. We have a comparison video and article here.